Triumph hasn’t cut any corners in making this full-sized scrambler! The 2019 Triumph Scrambler 1200 twins have been showcased at this year’s EICMA show. This Ducati Scrambler 1100 rival comes in two variants: base XC and the top-of-the-line XE version, which is a lot more offroad-centric than the former. 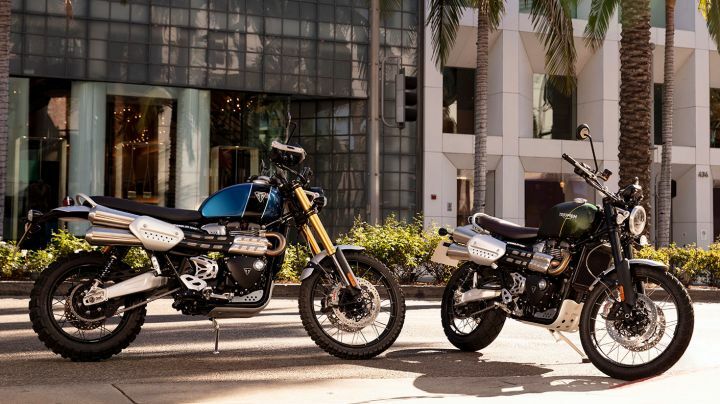 At the show, Triumph also unveiled the special-edition motorcycles based on the Bonneville T120 - the T120 Diamond and T120 Ace, both limited to 900 and 1400 units respectively. Triumph has designed the Scrambler 1200 along the lines of the Street Scrambler, as evident from the simple yet sleek-looking tank with knee recesses, easy-to-reach handlebars, bench seat, and scrambler-style dual exhausts. Notable features of the Scrambler 1200 include a full-digital multifunction single-pod instrument cluster that’s compatible with a GoPro control system (standard on the XE), which lets riders capture images using the switchgear itself. The XE also comes with knuckle guards, heated grips, USB charging socket and cruise control as standard fitments. Furthermore, you get over 80 accessories, apart from preset Escape inspiration kit and Extreme inspiration kit to pimp your ride. Powering the bike is a 1200cc 8-valve parallel twin liquid-cooled engine which churns out 90PS at 7400rpm and 110Nm at 3950rpm. The powerplant works in tandem with a 6-speed transmission with torque-assist clutch. You get five riding modes (Road, Rain, Sport, Off-Road and Rider-Configurable) in the base model, and the flagship Scrambler features an extra rider mode: Offroad Pro. Further enhancing control is the inclusion of switchable traction control on the base bike and Optimised Cornering Traction Control on the XE. While the base variant rides on fully adjustable 45mm Showa USD and twin Ohlins piggyback shock absorbers, the XE gets fatter 47mm Showa inverted forks and Ohlins twin piggyback shocks with 50mm more travel (250mm up front and rear). Brakes for both the bikes include 320mm front twin discs grabbed by Brembo M50 monoblock radial callipers and 255mm rear disc with Brembo 2-piston calliper. While the XC makes do with switchable ABS, the XE gets more advanced switchable cornering ABS. These motorcycles are likely to be launched in India in mid-2019, with expected pricing starting from around Rs 12 lakh, ex-showroom. Apart from the Ducati Scrambler 1100, the BMW R nineT Scrambler and the Yamaha SCR950 are also some of its noteworthy rivals. Share your experiences with Scrambler 1200?